A post inspired by Bridgette. Meet the lianain. These wizened old men have seen it all… and, can literally remember it all. Their name means storyteller, or more precisely, Keeper of the Word. And in Timorese communities, they are guardians of their people’s history. Theirs is an oral tradition – the past, painstakingly remembered, and then verbally passed on from one generation to the next. It is said that the best lianain are able to accurately recount the arrival of the Portuguese, their subsequent departure, and even go into minute detail about what happened during the Indonesian occupation. We gathered one chilly night to film the recounting of Passabe’s history. It was the end of a long day of confessions and accusations – this was early on in our shoot, when the Truth Hearings were taking place. The lianain were in a merry mood. They had cracked open several bottles of palm wine – to keep warm… only to keep warm, we were told. Drink must have sharpened their storytelling skills. We didn’t understand a word of what they said, but the performance was mesmerizing to watch. But more than being mere historians, the lianain have other responsibilities. One oversees all things agricultural – he takes care of the rites to ensure that the rains come on time and the harvest is plentiful. Another is in charge of justice and security. A third looks after the sacred house, sacred sword and a host of other holy relics. All are adept at the art of sacrifice. We witnessed 11 ritual animal slaughters during our first week in Passabe – two buffalos, a goat, three pigs and several chickens. For the squeamish foreigner, the process isn’t easy to stomach. The chickens die quickly, but it takes several people to hold down a buffalo long enough for someone to pierce its neck with a sacred sword. Drops of animal blood are then sprinkled into the river, rubbed onto trees and rocks, and smeared into the ground as offerings to the gods. The animal entrails are removed and carefully scrutinised for omens – hints about what the future might hold. A feast follows. Everyone present is expected to share in a meal of pig, cow, goat or chicken. Declining is not an option. In fact, it’s considered downright rude. In Passabe, meat is a rare treat. 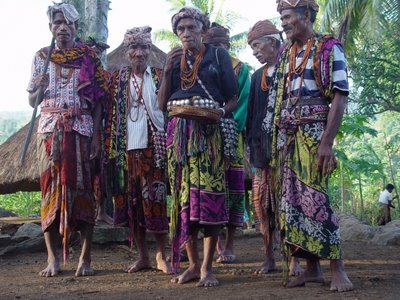 Over time, we got to know the lianain better, discovered their bawdy sense of humour, and learnt more about their customs. 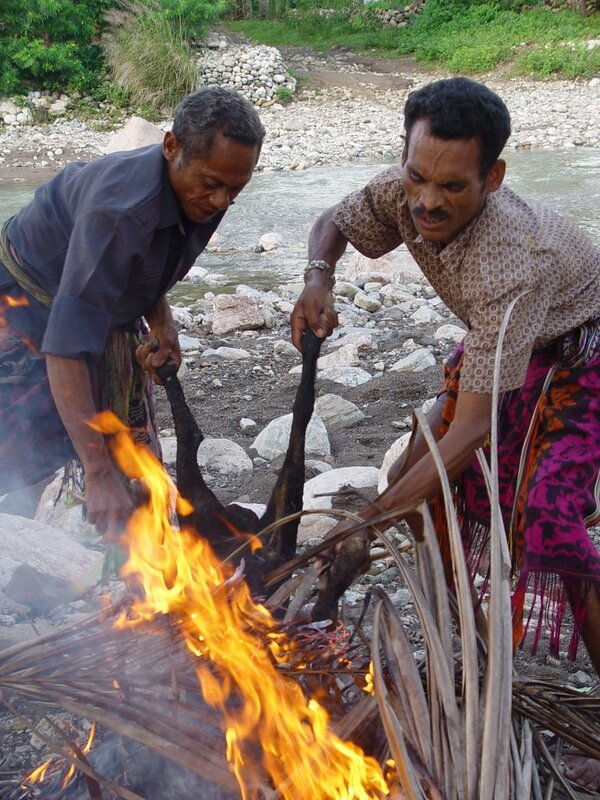 Their ancient rituals have survived years of persecution – we were told that during the Indonesian occupation, many of their practices were banned. Some ceremonies even had to be conducted in secret, at times, at great risk to those involved. Small wonder then that Passabe’s Truth Hearings were accompanied by such elaborate rituals. The lianain could finally tell their stories, the way they should be told.